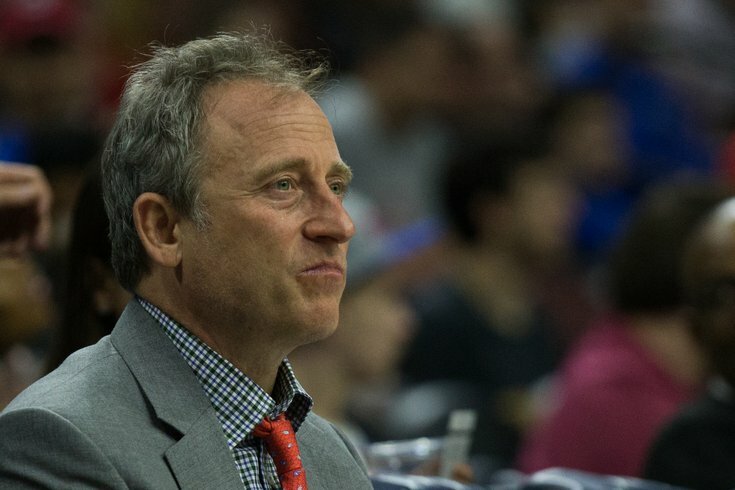 Philadelphia 76ers owner Josh Harris looks on during an NBA game between the Sixers and the Brooklyn Nets at the Wells Fargo Center in April 2017. Philadelphia 76ers co-owner Josh Harris was considered for a job in President Donald Trump's White House while advising the administration on its infrastructure plan early last year, according to a report. The New York Times reported Wednesday night that Harris had met multiple times at the White House with Jared Kushner, Trump's son-in-law and senior advisor. Among other things, the two discussed a possible White House job for Harris that never came to pass, according to the report. The meetings reportedly took place around the time that Harris was among several U.S. business leaders who advised Trump on financing for his $1.5 trillion plan to repair the country's ailing infrastructure. The report centered on Kushner and said that the Kushner family's real estate firm had received $500 million in total loans last year from two financial institutions with top executives who had met with Kushner at the White House. One of them was Apollo Global Management, an investment firm co-founded by Harris and for which he works as a senior managing director. The company lent $184 million to Kushner Companies last November to refinance the mortgage on a Chicago skyscraper, according to the report. Although the loan was one of the largest Kushner Companies received last year, Citigroup lent the firm and one of its partners $325 million to help finance a group of office buildings in Brooklyn, according to the report. An Apollo spokesman, Charles V. Zehren, told the Times that Harris was not involved in the decision to loan money to the Kushner family's company and said the loan “went through the firm’s standard approval process.” A spokeswoman for Kushner Companies told the newspaper that Kushner's senior advisory role in the White House played no part in the loans. Zehren did not immediately respond to an inquiry seeking confirmation that Harris had been considered for a White House position.